Huevos Rancheros - A recipe from Savor California, the online showcase for extraordinary gourmet foods and beverages from California. For the Ranchero Sauce, sauté onion, bell pepper, and garlic in 2 tablespoons vegetable oil until soft. Add green chiles, tomatoes and jalapeño. Add water to the pan just under the veggie level. Salt and pepper to taste. Cook for about 20 minutes. Warm black beans in a small saucepan. You can flavor the beans with 2 tablespoons of Mrs. A's Salsa Buena. Then fry corn tortillas in a small amount of vegetable oil in a skillet, one per person. Drain and keep on a paper towel. In the same pan, fry eggs or make a batch of scrambled eggs. 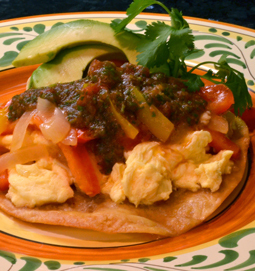 To assemble the Huevos Rancheros, layer the tortilla with a spoonful of black bean, top with eggs and Ranchero Sauce. Top with Mrs. A's Salsa Buena and sliced avocado. Add grated cheese if desired.